Yeah, Arbiter is the longest build time unit/building in the game. The CoachAI soon will have what this topic tried to reach and more (a real time track of the remaining build time for each unit/building in progress, but not upgrades) and not for Fastest only. Working to iron out my +1 Sair/Speedlot build to hit 5 sair and 6+ speedlots with +1 to move out by 7:15, and trying to debug my timings. These timings are helpful, but one question about gas: does the build time include the delay between the time the assimilator finishes and is "minable" (you know how you can send probes to mine "too early" and they end up just sitting there)? 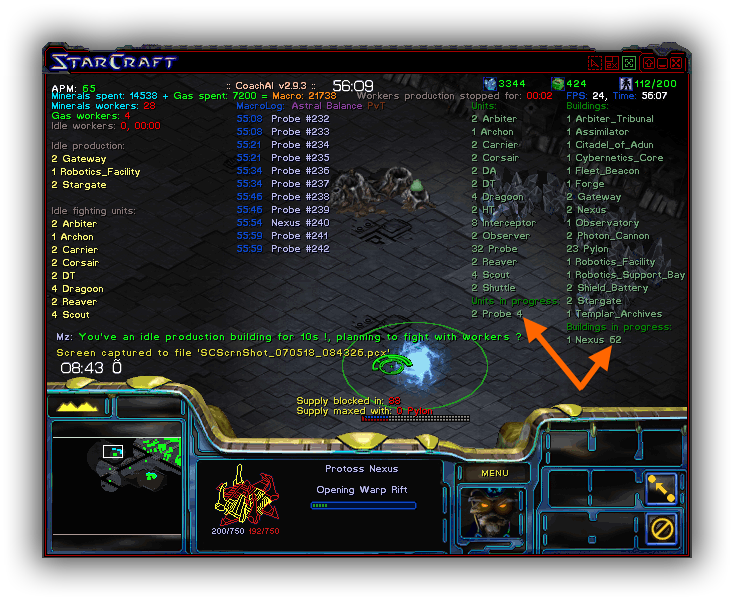 Interesting question, I just checked a replay and it does not include this transition phase, so it seems to take roughly additional 3 sec for Protoss until they can mine the gas (so 25.2s+3s~28s). Also it looks like this is generally the case for all Protoss buildings. For example when you build a gateway it takes 37.8s+3s until you can build a unit. Oh i never knew that! Thats what happens..
Ah, thanks! That's good to know. That means to have 5 sairs by 7:15, the stargate really needs to start by 4:10-4:15 at latest (also assuming there is constant sair production). Is this in seconds? And the commas are decimal points? So a zergling is 17.25 seconds? In-game seconds yes and yes to the rest. Yes. I believe fastest seconds are a little faster than IRL seconds. Real game seconds are equal to in-game seconds on fastest speed. I just wanted to be precise since for any other game speed setting this is obviously not the case.